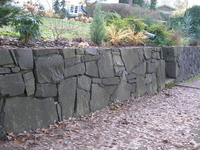 Black Basalt Wall... Scenery Inc. 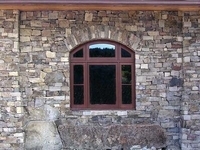 Quarry run Black Basalt is not typically sorted, graded or packaged like other building stone offered by Pacific Stonescape. It is delivered "quarry run" in bulk or customers can come to our yards to hand pick the sizes and shapes they need for their particular project. 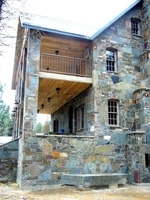 The material used in the photos here has been hand-selected by the builders of these walls and handled multiple times - driving the cost of the material up to a point comparable with stone imported from outside the Willamette Valley. 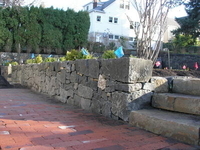 Coverage of this wall rock is typically 10-15 sqft.ton depending on the size and bed depth of rock being used. 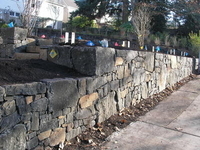 For more versatile offerings of this material see OREGON BLACK BASALT.